IT seems a lifetime ago now but it was just five summers back. A light drizzle had descended over the Twin Towns on a dreary July afternoon as Hurler ambled, disconcerted and glum, back to the car. Donegal had just about scraped past Clare in round two of the Qualifiers. Antrim, hardly a force in Gaelic football, had put Donegal to the sword in the quarter final of the Ulster championship at the same venue a month earlier. It couldn’t get much worse. The future of Donegal football, in the summer of 2009, appeared bleak indeed. Hurler fell into step with a stranger, an elderly gentleman, also heading for home. He summed it up in two words – “Buckin’ cat”. Fast forward three summers to another championship Sunday and Hurler recalls, clear as day, from a vantage point within touching distance of the rafters of the Cusack Stand, a moment of near total disbelief. And remembered “buckin cat”. Twelve minutes had elapsed in the All-Ireland final of 2012 and Colm McFadden had just kicked Donegal into an unassailable 2-1 to 0-0 lead. Sam was for the Hills. How, in under God, had we travelled in just three summers from being beaten first day out in Ulster to being All-Ireland champions? But by then of course the whole country knew the answer to that one: Jim McGuinness. The Glenties man too had watched as Donegal fell to Antrim that Sunday in June 2009. And saw potential no-one else saw. Durcan, the two McGees, Lacey, Cassidy, Gallagher, Kavanagh, McFadden, Murphy, Toye and McGlynn – the nucleus of a team he’d transform into champions – had pulled on jerseys against Antrim. Anthony Molloy it was who said after the Antrim match: “God Almighty wouldn’t win anything with them boys”. Long-suffering Donegal supporters thought that a fair analysis. None of us knew then that God Almighty thought differently. And he wanted the Donegal job. Hurler needn’t recount here Jim McGuinness’ incredible, unprecedented, truly iconic achievements as Donegal senior football manager over four summers: 2011-2014. Four summers that will be treasured for as long as leather is kicked in the Hills. Indeed, we can affix a fifth – McGuinness came the width of a crossbar from winning an U21 All-Ireland in 2010. One Ulster U21 title, three Ulster SFC titles, an All-Ireland SFC title and runner up in two All-Ireland finals. An awe-inspiring, stunning, jaw-dropping haul. Every team of note in the land was beaten on a championship Sunday under Jim McGuinness during this Golden Age of Donegal football. Donegal lost a mere four championship games out of 24 during that period. Memories that will last a lifetime were garnered on days when Jimmy was winning matches. Even on the days when Jimmy lost matches, it soured the experience not one iota. It goes utterly without saying that it has been an absolute privilege to follow Donegal during his tenure. Indeed, it’s near impossible to do justice to his achievements with mere words. A famous quote by Bill Shankly, the Liverpool manager, is often trotted out to quantify what sport means to the masses: “Football isn’t a matter of life or death, it’s much more important than that”. The achievements of Donegal during the Jim McGuinness era put a spring in the step of an entire county. McGuinness’ reign as Donegal boss coincided with recession. It has been, and continues to be, tough going. Folk have lost their jobs, some have lost hope. Folk in business have grafted long and hard just to stand still. In the midst of this along came the Glenties man to lead Donegal folk on an unprecedented journey when, for weeks and months at a time, the cares and tribulations of everyday life were parked to follow the incredible adventures of a bunch of footballers once dismissed as losers. 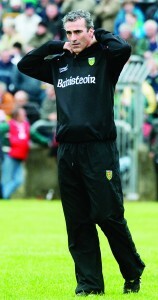 During that journey Jim McGuinness made an indelible mark on the lives of tens of thousands of Donegal folk. History, in the opinion of Hurler, will record him as the greatest manager in the history of Gaelic football. And he departs having ushered in a revolution in how the game is played – a man who dared to approach the game differently. Someone remarked that it was like a wake in the days after Donegal lost the All-Ireland to Kerry. When McGuinness pulled the pin on the Donegal job last Friday night, someone else observed that it was like a death in the family. Right enough, the three wanes were singing Jimmy’s Winning Matches the day after Jimmy stepped down and Hurler had a lump in his throat. But it was neither a wake nor a funeral. Jim McGuinness, whose family endured more than their fair share of real tragedy, would confirm that. Hurler, genuinely without the aid of hindsight, had made peace with the fact that McGuinness would go. It’s a good call on his behalf. It takes a smart man to know when to walk away – and Jim walks away with his reputation in the outer stratosphere. And with our gratitude in hot pursuit. Hurler has also made peace with the fact that Donegal did not lift Sam in Jim’s last match. In the grand scheme of things, when this Golden Age of Donegal football is consigned to the history books, it’s irrelevant. Far more important than names on trophies is the reclamation of long-misplaced pride and of a journey travelled supremely well. They were the best team in the country three out of those four summers – 2011, 2012 and 2014. Jim McGuinness has steered Donegal a long, long way from the days when “buckin’ cat” was a fair assessment of the county’s Gaelic football team. Like everyone else, Hurler has a handful of personal heroes. An eclectic list of folk, past and present, from life and history, deemed luminaries in Hurler’s head: my Da, Michael Collins, Bobby Sands, Teddy Kennedy, Martin McHugh. Add to that the name of Jim McGuinness. The man is a legend. Hurler suspects his like won’t be seen again. Whoever succeeds him in the Donegal hotseat faces a hellish task – McGuinness’ tenure set a new, impossibly high and glorious benchmark. Jim hit heights that will be hard followed. The Glenties man forced the whole country to pay rapt attention to the football revolution he orchestrated from the Hills. It is the Gaelic football equivalent of one of rock n’ rolls most famous, if – be warned – politically incorrect, tales. In the 1950s, Chuck Berry, Little Richard and Jerry Lee Lewis performed together. All demanded the closing spot. In Brooklyn, one memorable evening, for reasons of seniority, a promoter chose Berry. Jerry Lee did as he was bid and went on before Chuck Berry. He soon had the crowd screaming and rushing the stage, and when it seemed that the adulation could get no greater he stood up, kicked the piano stool across the stage, and launched into ‘Great Balls of Fire.’ As the noise in the venue went supersonic, he produced a bottle of petrol, doused the piano with one hand as the other hand pounded out the famous notes; and struck a match to set the piano on fire. No one had ever seen anything like it as Jerry Lee produced sweet, sweet music from the blazing keys – the kids in the theatre went utterly berserk with the frenzy of it all. It remains one of the legendary moments in the history of rock n’ roll. That’s what it’ll be like trying to follow Jim McGuinness. Hurler recalls another day long before Jim McGuinness was ever heard of. It was a day when Martin McHugh – a footballing genius if ever there was one – produced one of his many masterclasses in a Donegal jersey. Hurler can’t recall the venue now but can still see, clear as day, a man by the name of James Whoriskey – Jimmy Toner as we knew him in Burt – standing ramrod straight, clapping fiercely as Martin McHugh departed the field of play. He’s dead now, Jimmy Toner, but he travelled in all directions following the county on the Burt bus back in the 1980s and ’90s. Like the rest of us, the Wee Man was an icon as far as Jimmy was concerned. As McHugh crossed the sideline near where we stood, Hurler observed, with something bordering wonderment, the pure adoration Jimmy had for McHugh – an uninhibited appreciation of a footballing virtuoso. Jimmy stood on for fully a minute, long after everyone else had sat down, head to one side, lost – for once – for the words required to pay what he had just seen on the field a measure of justice. No words were needed. “Ahhhhhh, Martin McHugh!” was all Jimmy could manage in that moment of hero-worship. In an attempt to do justice to another hero, Hurler will paraphrase a line from Jimmy Toner. Make sure you pick up a copy of this weeks Inishowen Independent to see what the Hurler has to say next!